Description Mary's crown and the elegance of her dress reinforce the status of the embracing Virgin and Child as Queen and King of Heaven. 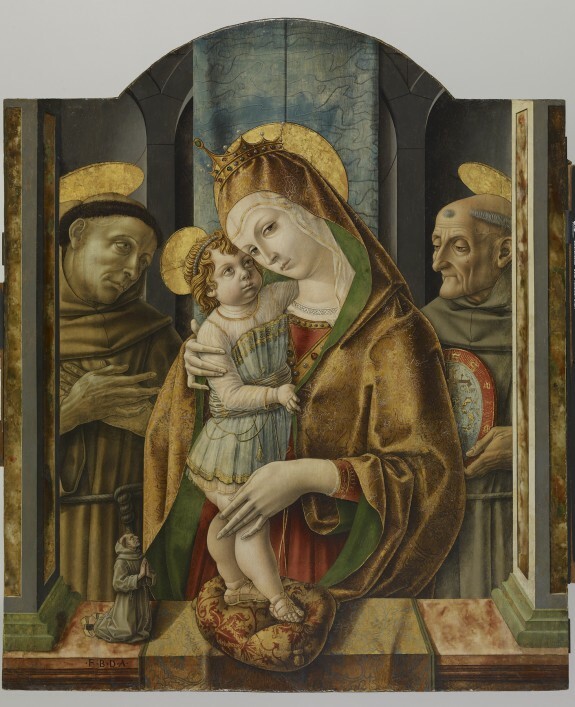 Saint Francis is standing to the left of the Madonna and Child and on the right is another Franciscan, Saint Bernadino of Siena, holding his attribute, the plaque inscribed with Christ's initials surrounded by the rays of the sun. The inscription at the bottom of the painting, “F.B.D.A.,” and the Franciscan habit of the donor—the tiny kneeling figure at the left—led to the identification of the donor as Fra Bernardino Ferretti, a member of the Franciscan order. His religious name was Fra Bernardino da Ancona. The size of the panel—small but larger (especially before it was cut down at the top) than paintings intended for private devotion—would have been appropriate for the altar of a small chapel. It may come from Fra Bernardino’s private chapel, dedicated to Saint Bernardino, in the church of San Francesco ad Alto in Ancona. The panel displays Crivelli's original style of employing sharp outlines, splendid surface textures, and striking illusionistic effects, such as the cushion on which Christ stands that seems to extend into the viewer's space. Ornament and Illusion: Carlo Crivelli of Venice. Isabella Stewart Gardner Museum, Boston. 2015-2016. A Renaissance Original: Carlo Crivelli . The Walters Art Museum, Baltimore. 2016. Inscriptions [Transcription] Inscribed in the lower left: F.B.D.A.